Club 54 members may exchange their tickets once per ticket order no later than 4pm the day of the original ticket’s show. All exchanges must be ordered within 30 days of notifying Feinstein’s/54 Below by phone only of the need to exchange. There are no refunds, and any tickets that are not exchanged within the 30 day order period will be forfeited. Each dollar spent on food and beverage is worth one point. 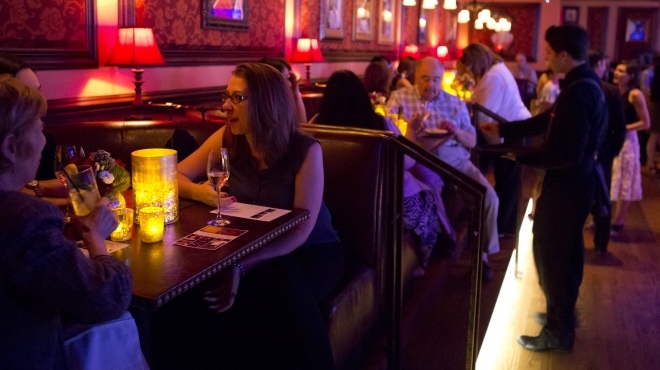 Each visit to a Feinstein’s/54 Below performance is worth 50 points. The reservation must be under the name of the Club 54 cardholder in order to track points. These points will be added when your server processes your check. Each dollar spent on a special event at Feinstein’s/54 Below is worth one point. Your Club 54 card must be presented to your server upon receipt of your check at Feinstein’s/54 Below in order to earn points. Your Club 54 membership is not transferable to any other person, including family members. Your Club 54 membership will automatically renew on an annual basis after your enrollment if you keep your credit card information on file. Membership fee subject to change. If you do not wish to renew and pay the annual fee, you may elect to cancel your membership. All special requests from Gold level members must be made through the dedicated Club 54 Concierge in order to be processed. All points must be used before membership expires. Your points will carry over into the next year upon renewal. If you elect to cancel your membership, any remaining points will be lost. Points earned can only be redeemed as directed at Feinstein’s/54 Below. Points cannot be exchanged or redeemed for cash. Feinstein’s/54 Below reserves the right to revoke a Club 54 membership at any time if it is determined that any benefits or privileges are being abused. Current members can check their Club 54 balance and view current rewards.